I can’t tell you how many people have flung this Facebook item at me since last night, starting with my wife. It’s already approaching 25,000 shares. I partner with great doctors — I don’t tell them what to do. And they welcome me doing it. I personally am completely opposed to a patient going in and saying, “I’ve decided I have condition X, and I want you to prescribe 42 mg QID of medication Y.” I mean, have you ever seen the things medical students have to learn to get their license? But I’m all in favor of a patient saying, “I have symptoms A and B, and from what I can tell from websites J and Q, that sounds like it could be M.” Explain your thinking, identify your source, and try to solve the diagnostic puzzle together: Collaborate. They’re not mutually exclusive: You can Google and check a professional source. Here are the wrong-headed government commercials. In contrast, here’s the sad story of a 19 year old in the U.K. who died two years ago after NHS docs told her (and her mum) “Stop Googling.” This year the hospital apologized after she died from something they didn’t know was possible — a recurrence of her unusual liver cancer. It’s absolutely, demonstrably wrong for a doctor to think that doctors know everything that needs to be known and patients can’t possibly know anything useful. 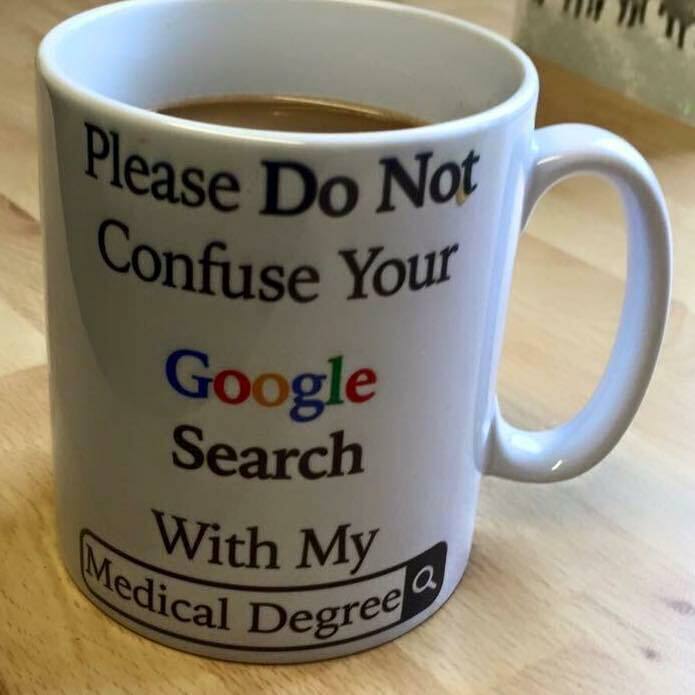 To the contrary, not Googling can bring death. That’s empowering. That’s modern. That’s participatory. Do it that way. The tricky parts of medicine are hard. Work together. Docs and other providers: Don’t find out the hard way that you (with the best of intentions) have become a “dinosaur doc” of the worst sort — one who refuses to see that the world has changed since they were licensed. If you were taught that patients can’t know anything, take a look around. Maybe even read our e-patient white paper, the 122-page manifesto funded by Robert Wood Johnson and published in 2007, documenting the reality of engaged, empowered patients. It’s a free download on the right sidebar of this blog. And patients, seriously: Think for yourselves, sure, but I advise that you not think that gives you the training and clinical experience those licensed people have. Think, ask, engage, participate. < Previous post Should physicians carry 2 sets of mobile devices?